When shopping for a fence in Austin, Texas, most people think about wooden fencing. It’s a traditional choice and offers a tremendous amount of privacy for a moderate cost. When choosing a fence, though, make sure you are choosing the best option for your home or business, both in terms of appearance and durability. Quality counts, and at Apple Fence Company, we are committed to providing you with the best fence materials. A wooden fence is a popular choice for homeowners, but not all cedar fencing is created equal. 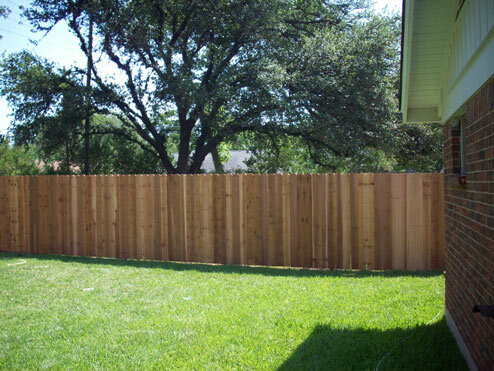 The most common type of cedar fence is the standard 6-foot tall privacy fence with vertical planks. You’ll see them all over Austin, and they’re a great choice, but they’re not all the same! Our cedar fencing professionals only use ¾ inch Western Red Cedar fence pickets, a choice that makes a tremendous difference when it comes to your fence’s strength and durability. If you’re like most people considering purchasing a privacy fence, you’ve probably checked out fence materials at a local home improvement warehouse store. You may have seen that they carry cedar pickets, but those are only ⅝ of an inch thick. Apple Fence Company, on the other hand, carries ¾ inch Western Red Cedar fence pickets. Why does this matter? When you choose to invest in the more substantial ¾ inch pickets, you are less likely to face damage from high winds or see your cedar fence succumb to the elements in just a few years. The thicker #2 Western Red Cedar wood we use prevents the pickets from cupping and warping, leaving you with a longer lasting fence. Choosing Western Red Cedar fencing means your fence will be naturally resistant to termites and wood boring insects. Looking to extend the life of your fence even more? Consider adding our popular cap and trim option to your privacy fence. Let us show you how Apple Fence’s expertise can help you. Give us a call or fill out or online form for a free estimate on your cedar privacy fence.